In 1911 the population of Hertford was recorded as 10,3841 including 253 people (192 soldiers, 21 wives and 50 children) at the barracks in London Road and 309 people (256 girls) at Christ’s Hospital in Fore Street. 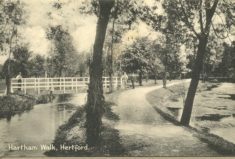 The main talking point in 1914 especially for those who were in it was the Hertford Millenary Pageant.2 The pageant was designed to comemorate the founding of Hertford in 914 by teh Saxon King, dward the Elder. The pageant’s effect on schools was limited. Two teachers, Walter Turpin, Master of Cowbridge School and Miss Harris, teacher at Christ Church Infants School took part in the pageant. Mr. Turpin wrote in the logbook, “June 29 to July 3. I left school early all this week at 3.30 pm. 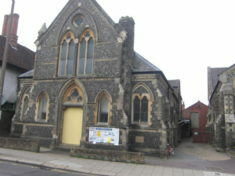 in order to take part in Hertford Pageant. Everything went on satisfactorily. Mr Howe Ed: Dept: Hertford agreed to be responsible for the closing of one class in the school. The elder children were taken to a rehearsal in the week preceding the actual pageant whilst the younger children were either supervised by an assistant or were given the afternoon off. On Monday morning, 3rd July the Bengeo Infant children assembled at 8.30 & 40 of the eldest children attended a Children’s Thanksgiving service in the Hertford Castle grounds at 9 a.m. arriving back at 9.45. 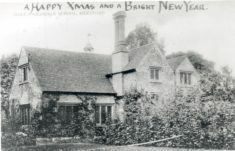 The younger children remained at school in charge of the elder assistant. Mr. William Edwards, who had worked for more than 10 years with Walter Turpin at Cowbridge and Port Vale joined the forces, presumably called up, on 19th June 1916. He returned to teach at Port Vale on 19th February 1919 having just been demobilised. In September 1916, Mr. Strubell reported: “Out of seven male teachers in the school only Mr. Green and myself remain.” Mr. Green was an uncertificated teacher (not qualified) in 1913 and was medically unfit for service. In March 1917 Mr. Strubel, Cowper School, learned that Harry Crawley, a teacher from the school, had been killed while serving with the Suffolk Regiment. 25th September 1914 Abel Smith Memorial School lost 12 children as families were removed from the barracks in London Road. In May, 1915 Miss Lethem, Cowbridge recorded attendance suffering because of the number of soldiers passing through the town. The children were obviously distracted by the sights and sounds! Cowbridge School had been significantly overcrowded for some years and HMIs were threatening to reduce the stipend. So Port Vale Boys School was opened in April, 1915 (after the Easter holiday) by Alexander Purkis Ginn, Mayor of Hertford. Mr. Walter Turpin moved from Cowbridge to be Master along with his deputy William Coleman. The Hertfordshire Mercury reported the cost as £2,744 4s. 2d., being £119 15s. 10d. less than the estimate sanctioned. This sum was exclusive of the salary of the clerk of works, quantity surveyor’s fees, and litho-graphic expense. There were four teachers at the opening of the school. Agnes Lethem became Mistress of the Cowbridge Girls’ & Infants’ School. The local education authority obviously decided that “the fabric” was worth maintaining as the school was used for various educational purposes until the mid-1960s! The Factories Act 1937 stated: In every workroom in which a substantial proportion of the work is done sitting and does not involve serious physical effort, a temperature of less than sixty degrees shall not be deemed, after the first hour, to be a reasonable temperature while work is going on, and at least one thermometer shall be provided and maintained in a suitable position in every such workroom. Bengeo Infant School logbook gives the temperature for most weeks for 1909 until midway through 1916. The chart in note 3 shows during how many weeks the temperature was below 60̊ F. It was clearly not a warm place to be for much of the year! Among the men killed was James Gregory, 55, who as well as being organist at All Saints’ Church was also a part-time music teacher at Christ Hospital and Hertford Grammar School. He married a teacher at Christ Hospital School. There were aeroplane raids on 13th & 14th June, 1917 when children were dismissed late morning on the Wednesday, most of the afternoon sessions being cancelled, and mid-afternoon on the Thursday. Inducements were given to children by the County Council to encourage good attendance. For one to four years full attendance book prizes were given; Certificates or medals for less than 10 absences and watches for full attendance over five years. At the end of 1914 Mr Strubel considered that the sole bright spot of the year at Cowper School was the giving of watches to five boys for perfect attendance. The tercentenary of Hertford Grammar School was in 1917 obviously not a happy time. Speech Day began with a solemn service in commemoration of the then 22 old boys7 who had lost theiir lives in the fighting. Their average age was no more than 22. After the Mayor had presented the White Gloves there were some brief references to the founding of the school. Five masters are recorded as having enlisted during the war and only one did not return. Marcel Coindeau returned with the Croix de Guerre! The School Certificate was introduced in 1917 candidates were expected to score a mark of 30% or more in five subjects, including one from each of Humanities, Foreign Languages and Maths/Science. HSC for sixth-formers. Hertford Grammar School’s First World War Book of Rembrance records 42 former pupils as killed in action. Often lessons on the Empire were given, history and geography including such people as Clive of India, General Wolfe of Quebec, General Gordon. Patriotic songs sung and the flag saluted. In 1916 the children of Christ Church Infants played the “Empire Day Game,” sang and saluted the flag. However, In 1916 children at Cowbridge School could not celebrate the day as the school was closed for a month from 15th May because of three cases of spotted fever6. Children were always given the afternoon off and they were given Friday afternoon off if the 24th occurred over the subsequent weekend! The war and the threat of airship attacks did not stop the children from Cowbridge furthering their education by going out into the neighbourhood, e.g. in 1915 classes went to Hartham to study trees; to Waterford Marsh to examine water plants and visited Molewood. The following summer the senior girls went on a walk to collect medicinal herbs. In February, 1916 the children from Cowbridge went to Port Vale to welcome Corporal Alfred Burt, V.C. an old scholar of the school and presented him with a cigarette case. Burt had been awarded his VC for ripping the fuse out of a German mortar in the trenches thus saving an estimated 20 lives. In 1917 Germany instigated unrestricted submarine warfare. This made it difficult to import food and shortages became a big problem. To combat this the population was encouraged to grow more produce. In 1913 Cowper School had been given a plot of land behind the offices of County Medical Officer in Fore Street opposite Christ Hospital. In 1917 the school produced 1025 lb8 of potatoes mostly King Edwards. Also 13 plots (rows) of other vegetables. In September/October 1918 Cowper School was closed for a total of 15 days for blackberrying. During this time the boys picked 18 cwt 2 qr 14 lb9 of fruit winning a silver cup presented by Lady Pearson of Brickendonbury, as well as receiving some payment for their efforts. The girls of Abel Smith collected 11 cwt 10 lb10 Children from the other schools were out scouring the countryside for blackberries! The older girls at Cowbridge also went blackberrying at this time but there is no record of how much they collected. Of course the schools were hit by the influenza pandemic of 1918! All schools were affected. No sooner had the boys of Cowper School returned from their blackberrying than the school was closed for more than three weeks because of the flu. Even when it was re-opened some teachers and boys were still affected. Other schools suffered in October. Port Vale Boys’, Cowbridge Girls’ & Infants and Christ Church were all closed for a couple of weeks in October. All the schools were given a half-holiday on 11th or 12th November when word arrived of the signing of the armistice. The peace celebrations were delayed until July 1919.11 Peace Week began on Monday, 21st July and on the afternoon of Wednesday, 23rd July, all schools held a tea party and games. Kelly’s Directory of Hertfordshire, 1912. 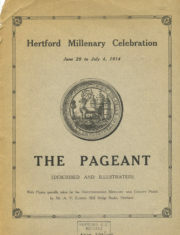 Hertfordshire Mercury produced a commemorative booklet on the pageant which along with other sources were used by Philip Sheail in 1914 to produce his booklet, Hertford’s Grand Pageant 1914, ISBN 9780955568428. This booklet is available from hertford Museum. In an effort to encourage attendance, children were given an afternoon off if the attendance for the previous month averaged over a certain figure. Spotted Fever is an infectious disease brought on by bacteria carried by ticks. In the Hertfordshire Mercury, Saturday, 24th April, 1915 it was describes as being cerebro-spinal fever (meningitis) with the following clinical features: profound disturbance of cerebro-nervous system indicated at onset chiefly by shivering, intense headache or giddiness. This page was added on 27/03/2019.